By Pawel in 2015 Technical Presentation on March 9, 2015 . Insightful look at the lending market. I had always heard about discrimination by financial institutions, and I think we even talked in this class or another econ class about how minorities learned to try setting up meetings through other means besides in person, but did not think that the numbers would prove the discrimination factor to be significant at such high levels. It’s also interesting to see how the numbers for how Blacks and Hispanics were treated vary by city. Definitely an expected outcome given the location of each city and L.A.’s proximity to Mexico, but interesting nonetheless. 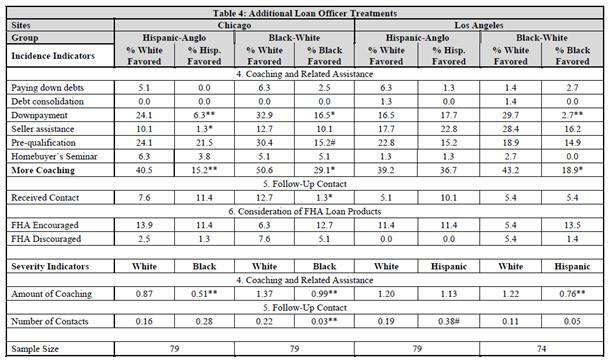 My question for the people that did this study would be: Are there differences on how people get treated based on the race of the loan officer as well? This would add another subcategory into their study, so they would probably have to add more test subjects to make their sample size big enough — once again getting into the issue of this being frowned upon/illegal since they’re falsely taking up the loan officer’s working day. But, it would be interesting to see if other races are partial in a different manner, especially in cities as diverse as these two. Li, this is a very fascinating comparison between the two cities and how lenders in those cities treat the minority population. The difference in the treatment of minorities between the cities is a reflection of the entire differences in culture in each city. I am very familiar with both cities having grown up in the Chicago area and with family in the LA area. It’s interesting to think about what caused or continues to promote the differences in lending treatment and doing so requires analysis of other racial trends in each city. One big factor that comes to mind to explain Chicago is the unfortunate degree of racial neighborhood segregation. 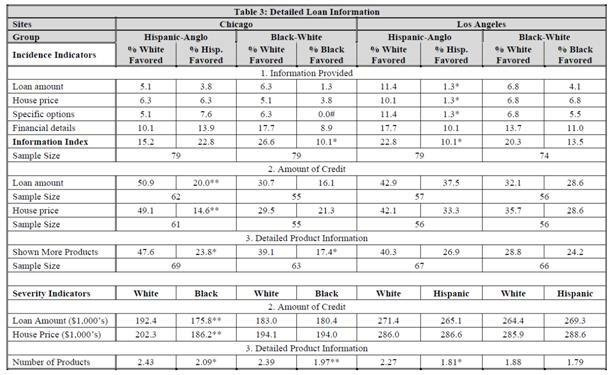 Neighborhoods within Chicago are so incredibly racially pronounced that seeing racist practices take hold in the lending industry is not surprising. Seeing the lack of racist practices in LA is also not surprising because of the cultural acceptance of immigrants/minorities, especially with Hispanics due their strong community and historical relationship with California. Considering these cultural differences, an interesting extension of the paper could include the degree of racial segregation among the neighborhoods in each city. I think it can be hypothesized that when a city’s neighborhoods are more racially defined, discriminatory treatment in the lending industry would tend to be higher than in a city with more diverse neighborhoods. Proving or disproving that hypothesis with more city data would make for a really fascinating paper.